Lexus has updated its LS600h luxury flagship model and it can be identified by a new front grille and restyled front and rear bumpers. There are also new LED sidelights and indicators incorporated into the door mirrors. Inside, the LS600h now has a LCD dashboard display, while the front seats have new 'butterfly' headrests that wrap more closely around the occupants' head for comfort and safety. An updated satellite navigation system is used and its hard disc can also store music to be played in the car. Also new for the cabin is the Rear Seat Upgrade Package, which now available as an option on both four- and five-seat models. It includes four-zone climate control, multu-function arm-rest, rear side airbags, electric seat adjustment and electric sunshades on both rear doors. Lexus has also upgraded the LS's brakes, which it says increases stopping power by 12.5%. Using 380mm Brembo front discs, Lexus says the new set-up reduces wear and vibration while providing fade-free stopping. 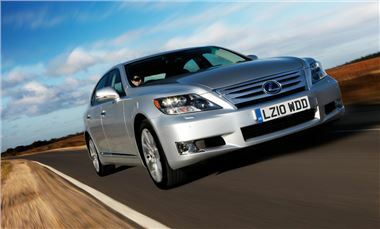 The revised Lexus LS600h is on sale now and prices start at £87,444 for the LS600H L.